(TibetanReview.net, Nov29, 2017) – A delegation of four members of the Tibetan parliament in exile at Dharamshala, India, has met with the Special Envoy of the European Union’s Freedom of Religion/Belief and spoken on the situation in Chinese ruled Tibet in the European Parliament following their arrival in Brussels on Nov 21. Following their meeting with the special envoy, the delegates joined four members of the Tibet Interest Group in the European Parliament to discuss the situation in Tibet with 11 representatives of European parliamentarians, said the Central Tibetan Administration (CTA) on its Tibet.net website Nov 28. 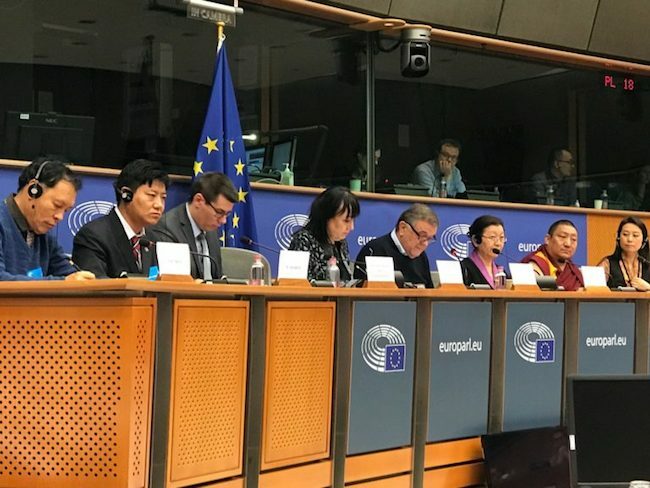 Later on Nov 23, the delegates were stated to have spoken on the urgency of the situation in Tibet in the European Parliament. The CTA news report said the delegates also held discussion with four members of Belgium’s Ministry of Foreign Affairs. The Tibetan delegation – led by Ms Dolma Tsering and including Geshe Aatuk Tsetan, Mr Dawa Phunkyi and Mr Ngawang Tharpa – is visiting Brussels (Belgium), France, Switzerland and The Netherlands over Nov 11-30.